6am to 7am, N. Division Street and the Boardwalk. Open to all. Sponsored by Ocean City Christian Ministers Association. For more information, contact Sean Davis at 410-289-6573 or [email protected]. The event is open for all Worcester County residents 50 and older and tickets are available (in advance only) for $15.00 / person (Tickets limited to 100 people/ first come first served). Including in the price of the ticket is social time, dinner catered by Decatur Diner, door prizes, and live jazz entertainment (see attached poster). 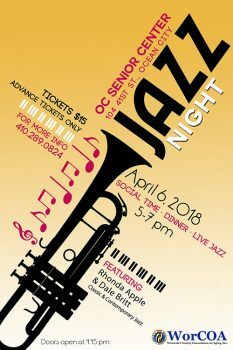 Tickets can be purchased at the Ocean City Senior Center by calling 410.289.0824 (cash/check / money order). This is a fun event! Meet the Beach’s top wedding vendors in a tropical bayside setting. Enjoy free appetizer and dessert samples, vibrant entertainment, dance demonstrations, Bridal Fashion Expo and Men’s Formal Wear display. Feeling adventurous? Seacrets Beach Cocktails are available for purchase! Vendors will be giving away prizes and gifts, including a Free Caribbean Cruise for Two from Rox Beach Weddings. 1pm to 4pm. $9 online or $10 cash at the door. For more information, contact Sean Rox at 410-289-7699 or [email protected] or visit www.roxbeach.com.